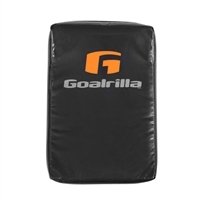 The Goalrilla Blocking Dummy is built with incredible strength and durability to withstand heavy abuse. Made with heavy-duty PVC and high-density foam, this blocking dummy withstand up to whatever you can throw at it. This is a perfect dummy for simulated contact drills for any sport, including football and basketball. With reinforced straps and 2 heavy-duty handles, the Goalrilla Blocking Dummy allows you to stay in control during the most intense workouts. The Goalrilla Tackling Dummy is designed to take the toughest abuse and provide better control during contact drills. 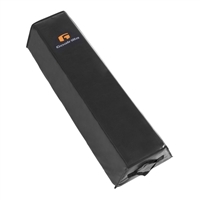 It features three reinforced heavy-duty handles for long-lasting performance and a secure hold. Perfect for football, soccer, basketball, kickboxing, mixed martial arts and military training, this tackling dummy can help increase athlete strength and stamina. The Goalrilla Gamemaker Portable Soccer Goal with Baroforce Technology is perfect for family-friendly indoor and outdoor play, futsal, beach soccer, or European handball, and it's ready to go anywhere. This incredible, revolutionarily transportable goal fits in an easy-to-carry storage bag and pumps up to full size in 90 seconds. No adult needed to set up! Using incredible Baroforce reinforcement and pump technology, the frame becomes rigid, ready to take anything you can kick out. Because the goal’s frame is pressurized, your basement or bonus room walls and floors are safe from damage and keeps players safe from injury. Baroforce technology allows the Goalrilla goal to hold 1 bar of pressure. There's a flexible interior layer of thermoplastic polymer, a middle layer of high-tenacity yard, and an exterior layer of polymer that stiffens at full pressure. As it fills up, the goal takes shape – use the include weight bags (filled with sand) and anchors to hold it into place. When the game is over, use the 2-way pump to quickly flatten your Goalrilla and head out! 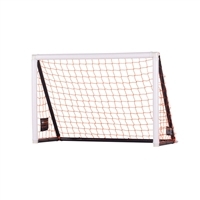 The goal is designed for ages 6-12 and is incredibly durable.